WASHINGTON (Bloomberg) -- The U.S. is asking South Korea to accept American automobile safety and emissions standards in an effort to advance a free-trade agreement, according to three people briefed on the talks. Under the proposal, if American-made automobiles meet U.S. regulatory standards, South Korea would have to permit the vehicles to be sold in that nation, according to the people, who spoke on condition of anonymity because the negotiations are private. The people weren't able to say whether the provision would be permanent or in place only during a transition period. The U.S. is demanding changes in provisions covering autos and beef sales under the agreement, which was signed by the two countries in 2007 and never implemented. Those changes are needed in order to get the agreement passed by Congress, U.S. Trade Representative Ron Kirk has said. “There will be no big impact on demand for U.S. automobiles even if South Korea accepts American safety and emissions standards,” said Suh Jin Kyo, a director of research planning and coordination team at Korea Institute for International Economic Policy. Stricter regulation is not the main reason for U.S. automakers' weak sales, he said. While South Koreans are buying more cars from overseas, they prefer European and Japanese models. 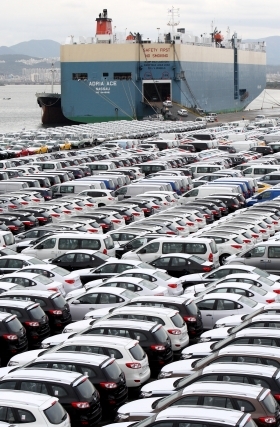 Imports rose to 7 percent of the domestic market in the first nine months, from 4.9 percent last year. American-made automobiles have been losing market share, sliding to 10.1 percent of imported car sales last year, from 11.3 percent in 2008, according to Korea Automobile Importers and Distributors Association. European cars held a 62 percent market share in 2009, with Japanese brands on 27 percent. Non-tariff measures on autos, such as standards, are of concern to the Obama administration, according to an official who declined to confirm details of the discussions. Ford Motor Co. and the United Auto Workers union have led opposition to the accord, saying Korea has used tax and regulatory barriers to block sales of U.S.-made automobiles in its market. The two sides have set the Group of 20 meeting in Seoul next month as a deadline for working out changes to the accord. Kirk met with his counterpart, Trade Minister Kim Jong Hoon, in San Francisco this week. They didn't say what was discussed. With almost $68 billion in two-way trade, the deal would be the U.S.'s largest free-trade pact since the North American Free Trade Agreement in 1994 and may help President Barack Obama meet his goal of doubling American exports in five years. South Korea's automakers have made inroads in the United States, which imported $8.4 billion worth of autos and auto parts from Korea in 2009. That could increase by as much as $1.7 billion a year as a result of the free-trade deal, the U.S. International Trade Commission estimates. The U.S. sent only 6,140 autos to Korea last year, according to the American Automotive Policy Council. John Brinkley, a spokesman for the Korean Embassy in Washington, said he couldn't comment on pending negotiations.